Note: If you venture up to the 8th floor of the Cofrin Library and take a look out at Green Bay, you will see sand bars that normally are under at least a few inches of water. This article from Newswatch: National Geographic details some the possible explanations of what we’re seeing. “For people living around the Great Lakes, water levels this past month have appeared much lower than many will remember. The upper Great Lakes reached near-record low water levels in October. This was most evident on Lake Michigan and Huron, where lake levels dropped to less than two inches (4 cm) above record lows and 28 inches (71 cm) below the long-term average. All five lakes, plus Lake St. Clair, remain below their long-term averages. Rock and sand recently exposed by low water levels made stretches of the northern Lake Michigan shoreline look like a moonscape. Recreational boaters had trouble navigating the shallow water this fall, and shipping companies lightened loads to compensate for low water. Lakes Michigan and Huron hovered just above a record low set nearly 50 years ago, and Lake Superior was within five inches (11 cm) of record lows set in 1975. A 2002 National Geographic magazine story, Down the Drain: The Incredible Shrinking Great Lakes, documents declining lake levels and the potential economic and ecological consequences for the region. Ten years later, the story continues to unfold, as water levels remain lower than normal. Experts blames the recent low water on the unusually warm and dry weather over the past year. Rain events in October, including Hurricane Sandy, delayed the inevitable, but forecasters predict Lakes Superior, Michigan, and Huron will likely reach historic low levels in the late fall or winter, a time of year that the lakes are normally already dropping due to high rates of evaporation. 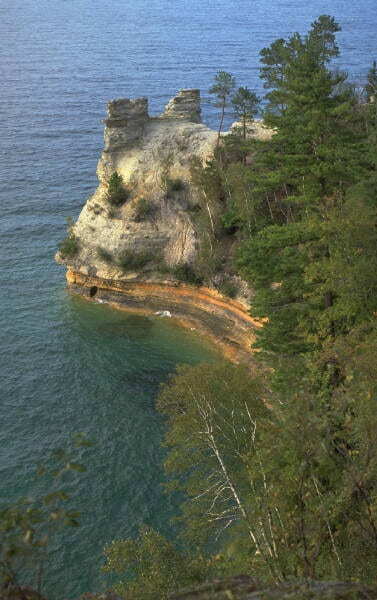 Low water levels are not the only climate-related trend being observed on the Great Lakes. Ice cover is also declining. The Great Lakes have lost 71% of their ice cover since 1973, according to a study by the Great Lakes Environmental Research Laboratory (GLERL). This past winter, the Great Lakes, including Lake Superior, were virtually ice free with just 5% ice coverage, the second lowest on record. Similar to the global assessment conducted in 2000, loss of ice cover is being reported on lakes throughout North America, Europe, and Asia. Summer lake temperatures are also on the rise. As mentioned in one of my previous posts about warming lakes, the Great Lakes are among many lakes in the northern hemisphere experiencing a rapid warming trend. Lake Superior, the largest freshwater lake in the world by surface area and third largest by volume (after Baikal in Siberia and Tanganyka in Africa), is also one of the most rapidly warming lakes in the world. Because lower lake levels are considered one of the potential consequences of climate change, I was curious to find out whether there was any connections to what is being observed on the Great Lakes. I recently had the opportunity to talk with John Lenters, a lake and climate scientist, while we attended a meeting of the Global Lake Ecological Observatory Network (GLEON) in Mulranny, Ireland. When comparing notes about our personal connections to Lake Superior, I learned that this accomplished scientist, with a laid-back Midwestern manner, first fell in love with the Big Lakes as a 14-year-old boy while on a backpacking trip in Isle Royale National Park. “Although the trip was grueling, I was awed by Lake Superior and realized I wanted to study lakes,” Lenters told me. Now an associate professor at the University of Nebraska – Lincoln (UNL), Lenters studies lake-climate interactions in the Great Lakes region, the Alaskan Arctic, and western Nebraska. Given the global implications of his research, he joined GLEON in 2008 and helped to form the new Global Lake Temperature Collaboration (GLTC), hosting their first meeting at UNL, this past June. With his boyhood dream as inspiration, he and his collaborators are leading the way to learning more about how climate change is affecting lakes around the world, including the Great Lakes. Is it or isn’t it? Click here to read the rest of the article. With the completion of construction on the Student Services Roof Plaza, the new planters are ready for planting….except, well, it’s the end of November! 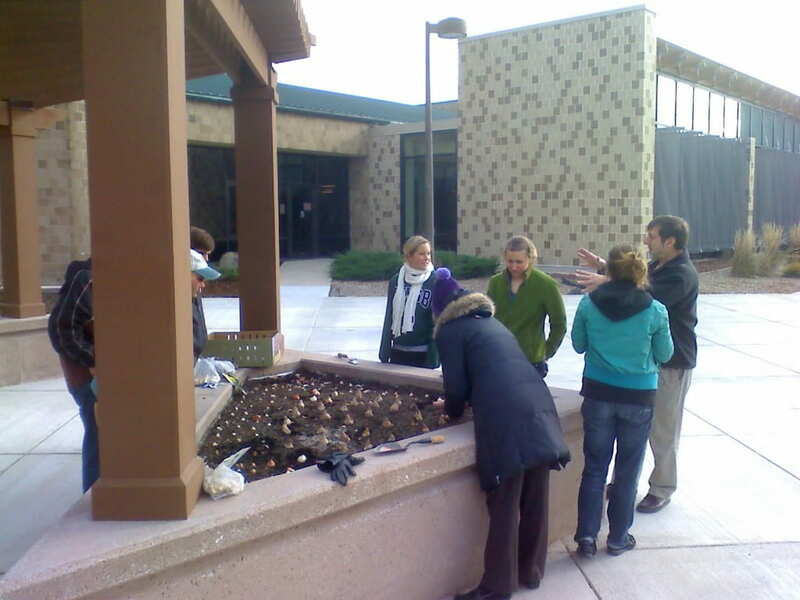 Not to be deterred, several student organizations gathered together to provide planting power for flower bulbs purchased by Facilities. 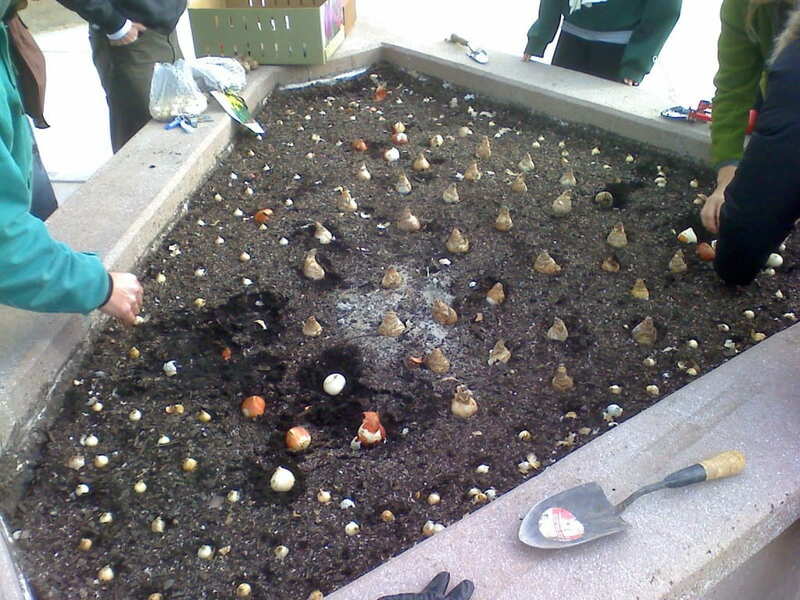 On a chilly Thursday, the team from the SGA Environmental Affairs Committee, PEAC and SLO tucked in several hundred tulip and daffodils bulbs for their long winter nap. Come next spring, the triangular area under the small pergola will be the brightest spot on the Plaza. Additional plants and landscaping will occur in late Spring in all the planters when the soil and air has warmed enough to support their establishment. In addition, SLO will be using several of the planters in the middle of the Plaza for their annual campus organic garden. Tables and seating will also be added in the Spring helping to make this a new go-to spot for enjoying the nice spring and summer days outside. Will Wisconsin election results tip scales against renewables? Will changing political winds in Wisconsin mean another new direction for wind energy policy in the state? Wisconsin Republicans reclaimed control of the state’s senate last week, five months after recall elections tipped the balance to Democrats. Republicans will now hold power by a wider margin the 2013 than they held in 2011. Wind energy advocates are worried that might mean another attempt to repeal the state’s wind farm siting rules, which limit restrcitons that local governments can place on proposed wind developments. And one Republican state senator has already announced plans to seek a repeal of the state’s renewable electricity standard, though a renewable advocacy group doubts the bill will gain enough support to pass. Overall, RENEW Wisconsin program and policy director Michael Vicerman expects less hostility and more acceptance of the fact that renewable energy plays a growing role in the state’s economy. “We are hearing that there are Republican senators that want to introduce positive legislation on renewable energy next year, and they want to do so in a bipartisan fashion,” Vickerman said. RENEW Wisconsin is a member of RE-AMP, which also publishes Midwest Energy News. While Republicans haven’t announced their energy agenda, RENEW Wisconsin is concerned about a proposal by Republican state Sen. Frank Lasee that would un-do the state’s wind farm siting policy. “He’s spearheading a one-person jihad against wind energy,” Vickerman said. 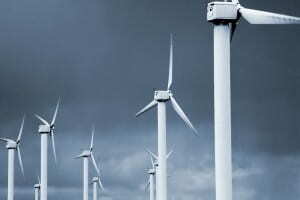 Wisconsin adopted statewide wind siting rules in 2011 that put boundaries on the local zoning and permitting regulations, which had delayed or derailed wind projects in some counties. In March, Lasee introduced a bill that would have rolled back those rules, putting wind developers back at the mercy of a messy patchwork of local rules, some of which were, in Vickerman’s words, “a never-ending obstacle course” meant to discourage any projects. Lasee’s effort last spring came up one vote short when Republicans had a 17-16 margin in the state senate. Next year, Lasee’s party is expected to hold an 18-15 majority. The American Legislative Exchange Council, a conservative policy group that promotes identical, model legislation across the country, says it plans to make repealing state renewable mandates a high priority in 2013. State Sen. Glenn Grothman, a Republican from Sheboygan, has already announced plans for a bill that would freeze Wisconsin’s renewable standard at its 2012 levels. Vickerman said he is “not particularly worried” about Brothman’s bill. That’s because renewable energy has too many allies – from landfill operators to equipment manufacturers – who understand its importance to growing Wisconsin’s economy. “He is looking at legislation that would not only scale back commitment to wind energy, but also solar, biogas, landfill gas, hydro – all the resources are covered,” Vickerman said.